It’s often a challenge to convey scale, especially when it comes to really, really tiny things (I’m looking at you, atoms*) to really, really big things (ahem, Solar System). Visual representation can help us to see or comprehend scale, especially in places that we cannot often go (like the deep sea or space)! The environment that Alvin visits is not just deep, it’s one of the most extreme on Earth, thanks to a little something called pressure (which we’ll be exploring soon!). In the meantime, please enjoy these other visual depictions of scale for the Solar System and lakes and oceans. *I can’t actually see atoms, but I know that they’re there. 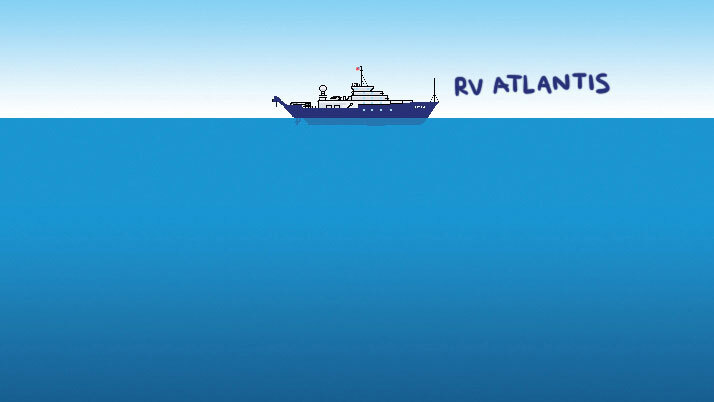 We will be using the research vessel Atlantis, the submersible Alvin, and the autonomous underwater vehicle Sentry, to find and collect samples of “popping rocks”—basaltic seafloor lavas that contain large amounts of carbon dioxide and other gases trapped in high-pressure bubbles that pop when the rocks are brought to the surface. We intend to use these rocks to understanding the composition and origin of gases in the deep earth. This project began with an expedition in 2016 that was cut short due to mechanical problems. You can still see blog posts from the first trip here, and we will continue adding to them during the 2018 expedition.